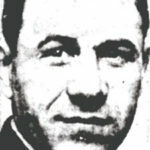 Ralph Michael Angelo Papa (Pope) was born in West Pittsburgh, Pennsylvania, on July 22,1920 to Italian immigrants Raffaele “Ralph” and Rose (Santina) Papa. Ralph was one of nine children (eight boys and one girl). His mother died in 1928 when he was only 8 years of age. He was graduated from New Castle High School in 1938. In September of 1939, Papa (Pope), enlisted in the Navy and served aboard the USS McCook (DD-252), but he became ill and had to return home in 1940. He was later drafted in September 1942, as were six of his seven brothers. A year later, after finishing Officer Candidate School he rose in rank from private to 2nd Lieutenant and was stationed at Ft. Bragg, North Carolina. In 1944, he was stationed at Ft. Jackson, South Carolina. He served in Europe with the 658th Field Artillery Battalion in Germany. After the war, Pope, remained in Germany as an officer with the Allied Military Government appointed as a military governor of Kreis Waldmunchen near the Czechoslovakian border. At the age of 25, he was the youngest governor in the European Theatre of Operations. In 1946, he left the Army as a Captain and entered the Army Reserves. He received his bachelor’s in Psychology and master’s in Psychometrics Degree from Duquesne University. He married Josephine Kennedy of Lowell, Massachusetts, and the two had a son, Ralph III in 1952. In 1953, Captain Papa and his unit were activated and ordered to Korea where he worked as a psychologist. He was promoted to the rank of major in the summer of 1954 when assigned to special duty with the United Nations Commission/Military Armistice Commission as a liaison officer in Korea. In that position he helped negotiate the body recovery program with the Chinese and North Koreans. Pope was next assigned as Chief of Enlisted Division at Fort Dix, New Jersey. In 1957, he was the Commander of the 761st Field Artillery Battalion at Ft. Sill, Oklahoma. It was announced in July 1959, that he had been assigned as an executive officer in personnel and administration of the Northern Area Command Headquarters, Frankfurt, Germany. In 1961 he was teaching political science to Reserve Officers Training Corps students at Seton Hall University, South Orange, New Jersey, where he held the academic rank of assistant professor. In 1962, he was promoted to Lt. Colonel. Pope was named professor of military science at that facility in 1964. 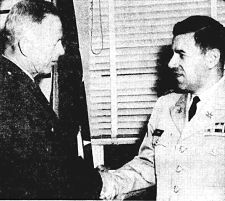 He reached full Colonel while at the Pentagon in 1967, where he was working as Chief Assignment Operations Officer for an estimated one million enlisted men. In April 1969, he was sent to Vietnam. 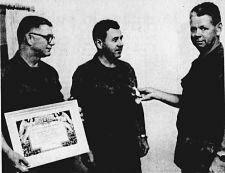 Col. Pope was presented the Legion of Merit when serving as Deputy Assistant Chief of Staff for Personnel with the US Army in Vietnam. In September 1969, he was also awarded the Vatican medal of the “Pro Ecclesia et Pontifice” by Pope Paul VI in recognition of his efforts in civilian and military church activities for more than 20 years. Col. Pope sustained injuries while in the service and received two purple hearts, the Bronze Star, Army Commendation Medal and nine service medals. Gen. Pope’s wife Josephine Kennedy also served in the Military. She was a Captain, Army Nurse Corps, during WWII. She died May 24, 1994 and is buried in Arlington National Cemetery. He returned to his hometown of New Castle, after his wife’s death. Pope went by Papa through most, if not all, of his military career.